Yesterday was all about the snow storm. It seemed to come from out of nowhere: beginning at 11 am Brooklyn began its transformation from mid-fall stupor to winter wonderland. The snow came down fast and hard and blanketed New York City with three inches by the evening. Last night, despite the inclement weather, eight of us made it to poker in Fort Greene. 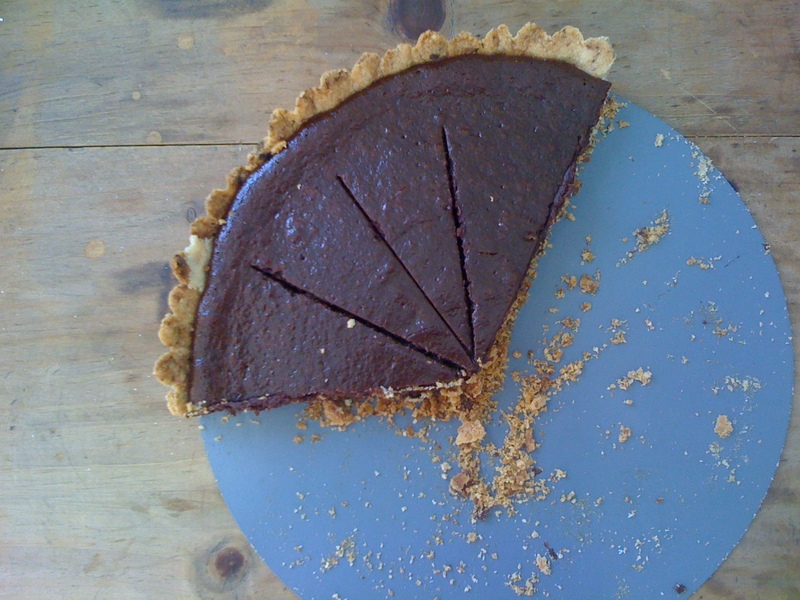 I decided I’d bring a dessert—it was a perfect day after all for staying inside with the oven on—and landed on a chocolate tart recipe by the trusty David Lebovitz. But first I needed to pick up the few ingredients I didn’t already have on hand (the chocolate, for one), and a tart mold. I’ve been needing a tart pan for ages so ran into Whisk on Bedford Ave. Whisk is a great kitchen supply store that opened in Williamsburg maybe two years ago and carries top of the line everything. Yuji double-parked out front and I ran in prepared to wince at the price tag and fork over my Visa. But it would be worth it, I thought, for a delicious chocolate tart! Well wasn’t I pleasantly surprised when the mold turned out to be a reasonable $8.99. And the icing on the cake? Christina Tosi, the Wonka-esque pastry chef, was in the back room signing copies of her new book, Momofuku Milk Bar, released this fall by Clarkson Potter. Given the freezing rain and general freakishness of the weather I was not surprised to find her hanging out with just a couple of Whisk employees, sitting around shootin the you-know-what, without many groupies in sight. I went up and introduced myself and then helped myself to two of her famous cake truffles, birthday cake and dulce de leche. Only three letters to describe those things: O-M-G. I flipped through the book, thanked her for her pastry wizadry and dashed back out into the freezing rain, into the warmth of the Volvo. It was an auspicious beginning to the tart-making. 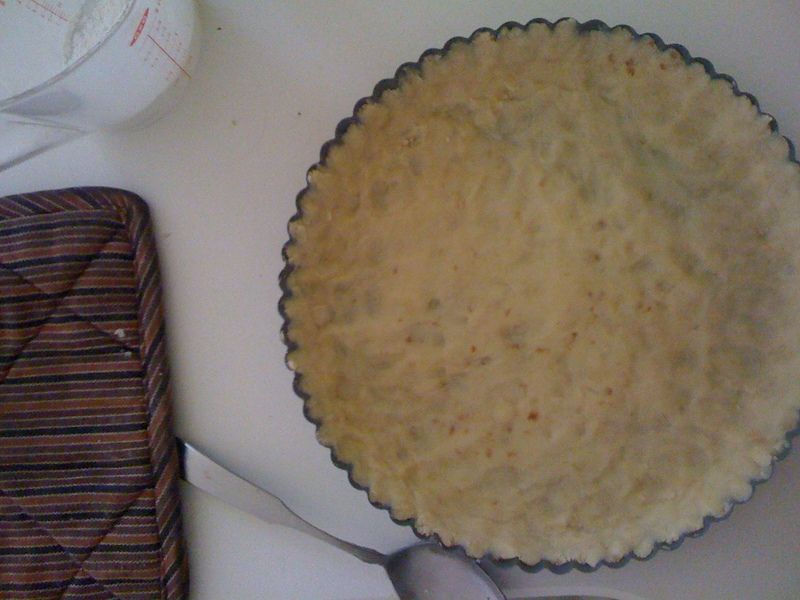 Back at the ranch, I began by making the pastry, for which I also used the recipe from David’s blog. It really was quite an easy job, requiring neither a stand mixer or electric appliance of any kind. He has a funny post here describing how he came to this particular recipe. You put butter, vegetable oil, water, sugar, and salt into an oven-proof bowl and place that in a hot oven for about fifteen minutes. 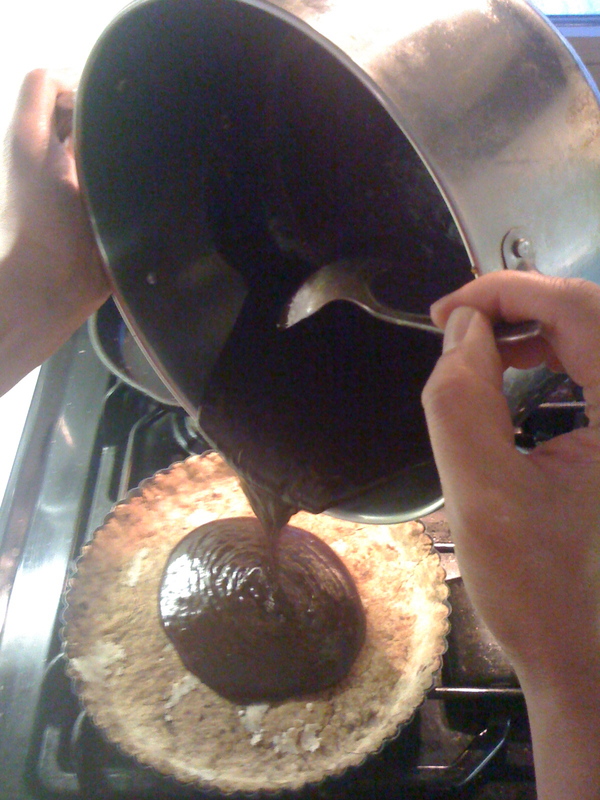 You take it out, add the flour, and voila, there is your pastry, ready to roll out into the tart shell. 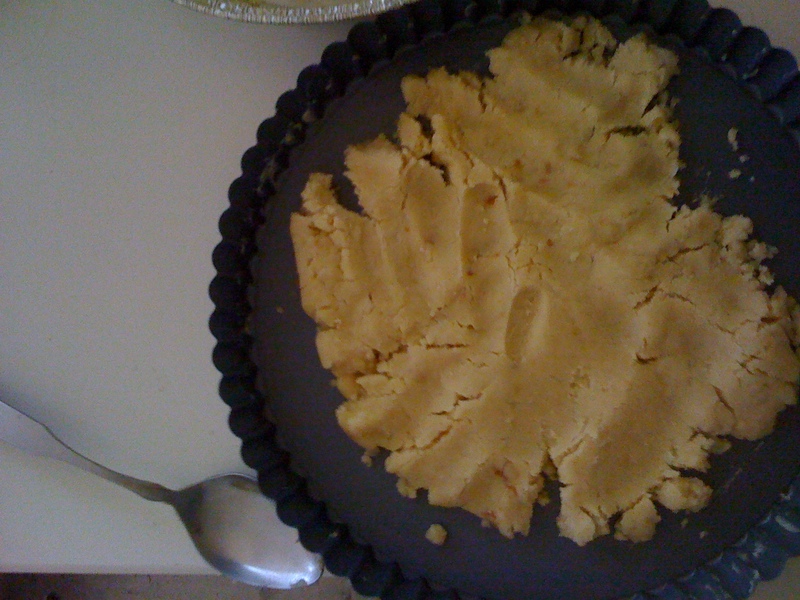 Using the heel of your hand you press the dough into the tart mold. You bake this in the oven to a golden brown before inserting your filling. The filling is all about bitter chocolate. But first actually you make caramel on the stovetop, melting the sugar until it is a liquid, sweet gold, and then fold in your chocolate. Buy good quality bittersweet and unsweetened chocolate. The recipe also calls for adding 6 tbsp of coffee and just a tsp of vanilla extract. You pour the mixture into your cooled tart dough and then pop it back into the oven. The resulting tart tasted hardly sweet; with the deep dark notes of the caramel, coffee, and chocolate, it was a nice ending to our pre-poker dinner of braised short ribs, polenta, and broccoli rabe. 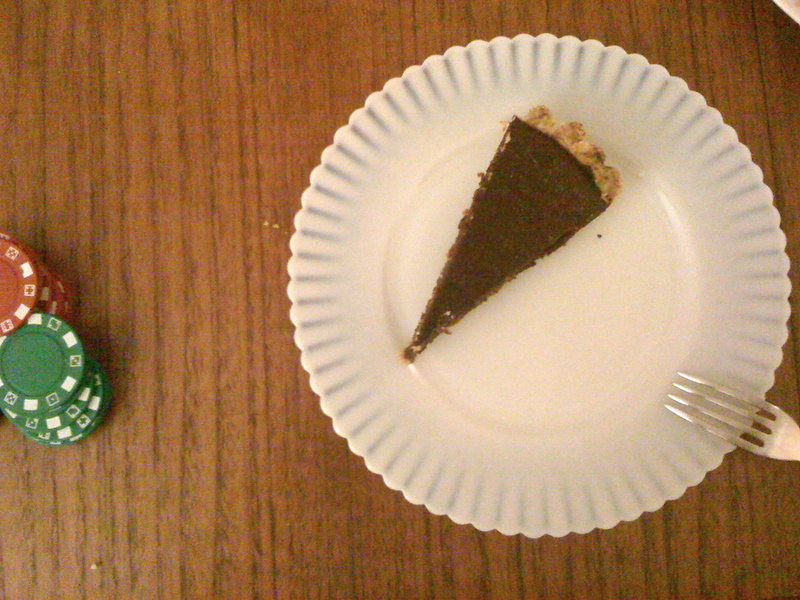 I was lucky the tart turned out well, but not quite as lucky at poker. In the end I only lost $6 though. 1. In a medium-sized ovenproof bowl, combine the butter, oil, water, sugar, and salt. 2. Place the bowl in the oven for approximately 15 minutes, until the mixture begins to bubble and just starts to brown. 3. Remove from the oven, being very careful not to burn yourself on the hot bowl. Stir the flour in quickly, until it comes together and forms a ball. 4. Transfer the dough to a 9-in. (23 cm) tart mold with a removable bottom and, with the heel of your hand, press it evenly into the bottom and sides. If the dough is still hot you can wait until it cools to handle. Reserve a small bit of dough for later in case you need it for patching up any cracks. 5. 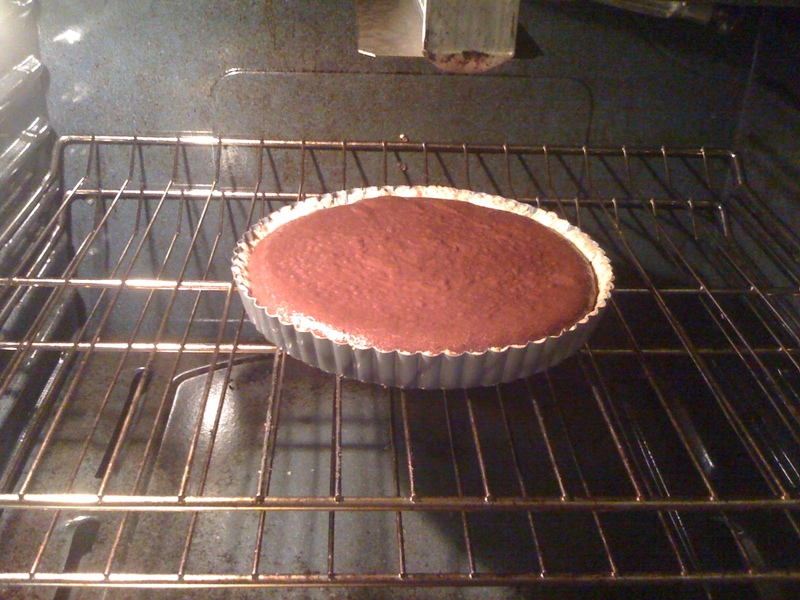 Prick the dough all over with the tines of a fork (about ten times) to prevent the dough from puffing up, and bake the tart shell in the oven for 12-15 minutes. Keep an eye on it so it doesn’t burn. You want the dough to be golden brown. 6. Remove from the oven and patch any cracks with the reserved dough if necessary. Let the shell cool before filling. 1. Lower the oven temperature to 350ºF (180ºC). 2. Spread the sugar in an even layer in the bottom of a large, heavy-duty saucepan or Dutch oven. Cook the sugar over moderate heat, stirring occasionally with a heatproof utensil, until it begins to liquify. Take care, as caramel can splatter and burn. 3. Once the sugar is melted it will caramelize quickly. When it begins to smoke turn off the heat and stir in the coffee. (You may want to avert your face and be sure to wear oven mitts!) Then add the butter and salt, stir until melted, then stir in both chocolates until smooth. 4. Once the mixture has cooled just a bit, mix in the eggs, then add the flour. Stir in the vanilla extract or rum. 5. Pour the mixture into your pre-baked tart shell then bake for about 15 minutes, just until the filling starts to rise and crack at the edges but the center is still jiggly. Do not overbake.